Search Engine Marketing (SEM) involves a variety of different tactics and strategies to gain search engine visibility, namely Search Engine Optimization (SEO) and Pay-per-Click (PPC) advertising. SEO encompasses everything that happens on your site to communicate with and give indicators to the search engines, from proper tagging, to quality content, to optimal site structure. Taking it a step further, SEO also encompasses all things that happen off-site such as linking, content, social media interaction, and far more. PPC encompasses the advertising that shows up in conjunction with search results when someone types in a particular keyword query, the most popular option being Google Adwords. As the term suggests, you pay when someone clicks on the ad. There are also many other opportunities and PPC type networks such as mobile ads, retargeting, video etc. While there certainly is no one size fits all answer to this question, I’d like to delve into these two different SEM strategies further, highlighting the important considerations for each. The goal is to help you better understand how they work and when and where they might be best applied. If there is one thing that you need for SEO, it’s PATIENCE! SEO is not simply a matter of writing some well-optimized copy and creating solid meta-tags. For most businesses, it goes well beyond that. These elements could be seen as the foundation to your search efforts, but in most cases you need to keep on building up from there. SEO is a medium to long-term strategy that requires commitment, both from a time perspective and financially. You will not see overnight success. You will have to keep on plugging away and it can involve a tremendous amount of work before you see any return on investment. While technically you are not paying for traffic, you do have to invest in the development of your SEO infrastructure. 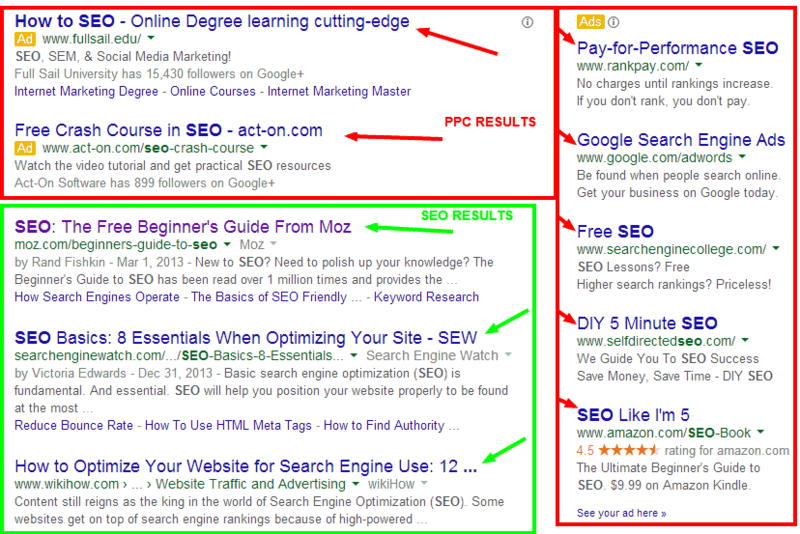 PPC can be more of a short-term strategy. You commit the funds, properly optimize your ads and they will run, giving you immediate visibility. Just to note that most businesses, however, don’t just run a few ads and then abandon PPC; usually PPC is also a long-term marketing strategy that requires ongoing, dedicated funds. 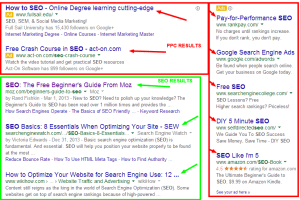 With PPC, generally you understand more clearly what you will get from your efforts, whereas SEO can be more intangible. ROI can be clearly tracked and measured with PPC and keeping track of your budget is pretty straightforward, although you need careful management to ensure nothing is wasted. The more experienced you are, the more efficiently you can spend budget. Without sufficient knowledge in PPC however, you run the risk of launching PPC campaigns that are ineffective at driving new business or waste resources unnecessarily. Another important consideration is that PPC can be quite competitive in some industries, so you must have a reasonable budget to complete or else you may experience a poor ROI. Since PPC isn’t simply plug and play, I recommend that you read through Google’s help files, and also consider reading a popular book on PPC management before attempting it on your own. Alternatively, get an expert on your side to manage your PPC campaigns. This depends, but these questions can help guide your decision. If you’re looking for a quick boost to sales, PPC could be your new best friend. As long as you have properly set-up your ads and chosen optimal bids, you should see an immediate influx of traffic but proper execution is key to ensure that this traffic is qualified. PPC is perfect for short-term efforts such as special promotions, product launches and other time-sensitive marketing efforts. If you’re looking to engender long-term brand awareness and build an authority site, with the ultimate goal of increasing sales and your customer base consistently over time, securing a solid rank in search results with SEO is a better fit when you want long-term traction, not just overnight visibility. If your answer is insanely so, you must consider whether you are able to commit to a level of SEO work that will keep you in the game relative to what your competitors are doing. Careful evaluation may well identify some underused terms that could be optimized for and may present an opportunity for making inroads. It will all depend on the industry. If you don’t feel that your resources are sufficient, then you may want to consider PPC as an alternative with a set daily/monthly budget so you know how much your investment will be month to month. With that being said, any SEO is better than none, and it is something that we recommend doing on an ongoing basis at any level to ensure you are being proactive consistently. If your industry or product is more niche and the competitive space isn’t stifling, you might find that some onsite SEO work will be sufficient to get you where you want to be in search rankings. If possible, your business will employ both SEO and PPC. They are complementary tactics that work in harmony to bring the right traffic to your site. The ideal situation when you’re looking to dominate search results for a particular keyword is where your website shows up both in organic results and in PPC ad slots. However, if doing both would mean a half-hearted effort for each, whether for financial or internal resource reasons, committing to one fully is always the best approach. Whether you decide to focus on SEO or PPC, or ideally opt for a combination of both, it’s crucial that your strategy is well-planned and properly executed. In this day and age of seemingly constant algorithm updates and Google penalties, falling behind can lead to disastrous results. If you don’t have the in-house resources to manage your SEO or your PPC campaigns, we’d love to chat with you further about how our expertise can help to fill in the gaps or take the reins of your SEM endeavours. Get in touch with us. Now it’s your turn to share your two cents. Where has your business seen the most benefit? Do you do SEO, PPC or a little of both? We’d love to hear about your personal experiences in the comments.